Australian swimming great Ian Thorpe has announced he is coming out of retirement and prompted hopes of a 2012 Olympic duel in the pool with American rival Michael Phelps. The five-time Olympic champion Thorpe, who will be 29 next year, wants to compete at the Games after his enthusiasm for the sport was reignited on a visit to the aquatics centre in London. 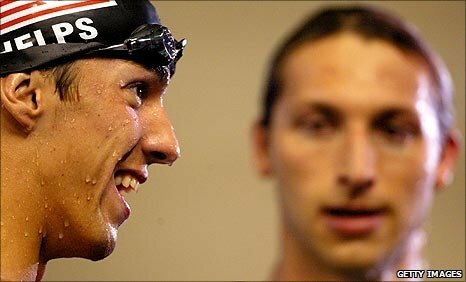 His return throws up the intriguing possibility of a rematch against Phelps, who he defeated in the 200m freestyle at the 2004 Athens Olympics, but will only be 27 when competing in 2012. Here, we speak to three leading British swimming pundits to gauge reaction to Thorpe's comeback. Ian Thorpe is still one of the most well-known names in the sport, even if you compare him to the likes of Michael Phelps. He did retire prematurely, but swimming is a lot of hard work and I'm surprised he wants to get back into the sport. He is going to have to work very hard to get into the Australian swimming team, never mind win medals at the Olympics in 2012. There are people over the age of 28 still competing at the highest level, especially in the shorter distances such at the 100m freestyle, but the fact he has been out of the sport for four years will be the biggest hurdle for him to overcome, physically and mentally. I'm always sceptical when people come out of retirement, and I say they are only doing it for the money. But he has categorically said that his return is not for the money and it is for the challenge and to be fair to him he did leave the sport early. It's going to be massive competition in London and gives the 2012 Olympics a very high profile with Phelps going for 20 gold medals [he has 14 already]. Thorpe is probably thinking he could be the person to stop Phelps in the blue riband event, the 100m free, and seal his place in history. Personally I don't really rate Thorpe's chances. I know that sounds insane but there is a whole array of other swimmers who will challenge him. He has been out of the game for four years and in that time world records have been broken and the sport has moved on and the expectations of swimmers has moved on. Nonetheless it is still a mouth-watering prospect but we've got to be fair to Thorpe and not put too much pressure on him. It probably enhances the profile of the Games a little but it does create a lot more attention to the swimming pool. I'm selfish, I'm a swimmer and I want there to be a lot of attention on my sport and this can only help. It's great for the sport that Ian has decided to make a comeback. He retired very young and was an absolutely incredible swimmer and he had an incredible career. You could sort of understand why he decided to retire because he achieved everything there was to achieve. But the fact he is motivated and is excited about the challenge is great for the sport. It's going to be difficult for him to be as good as he was and as dominant as he was. A lot has happened and the sport has moved on quite a bit. However, the majority of improvements in terms of times have come because of the new swimsuits which he never had the benefit of. But now we are back to the guys swimming in shorts, and it is more of a level playing field so the margins of difference might not actually be that great. It has been a long time but he is a phenomenal athlete and so much of swimming is down to motivation. He has clearly been in the water and is obviously happy with how things are going. He wouldn't put it all on the line if he wasn't happy and if there wasn't a spark there. He is still young enough to be able train hard and put the hours in. It's going to be interesting because the events he swims are the toughest because there is a depth of talent such as in the 200m freestyle. It won't be as simple as just Thorpe and Phelps going head to head as there is a host of other talent but the prospect of those two swimmers in the water racing is just so exciting. This will raise the profile of swimming at the Olympics further. The pool is the most iconic venue of the Games. Michael Phelps alone is a massive draw, especially after his performance in Beijing and him saying he wants to add another six medals at London. But now the possibility of the two greatest swimmers we have ever known being in the same race is going to be huge. I don't think it matters that there will be other people going for that gold medal. It is just so exciting, I can't wait to be there myself. I think because swimming is impact free, it is one of these sports where you can go on a little bit longer. Dara Torres, the American swimmer, is going to be 43 at the next Olympics. If you look back at his history he achieved everything so young and I think he got to the stage where he was under so much pressure from the Australian public he probably thought, 'I've achieved everything I set out to do, I'm not going to put myself through this anymore, I want to try others things'. knowing him as I do, probably something about quantum physics. His last real competitive race, which was at the 2004 Athens Olympics, was the best race I have ever seen and he got injured after that so he hasn't really competed competitively at the highest level for six and half years. At the age of 28, he'll be that much older, that much stronger. If you look back at his time in 2004 for the 200m freestyle, he is still ranked number one in the world. So if he can get back to where he was before in 2004, then he will be the best in the world again. If that is possible, then it's really exciting for him and it is really exciting for the sport. Phelps versus Thorpe is a very interesting battle. Since they last swam against each other Phelps has moved on a little bit but those two going up against each other in the 200m freestyle will be the talk of the 2012 Olympic Games. I would say that as things stand Michael Phelps would be the favourite in that battle, but it all depends on how quickly Ian can return to fitness. People will ask is 18 months long enough to get up to that level? With Ian's talent the answer is definitely, yes. If the two went up against each other at the Games, my money would be on Thorpey. Steve Parry and Karen Pickering were talking to BBC Sport's Jessica Creighton. Mark Foster was speaking to BBC Radio 5 live.